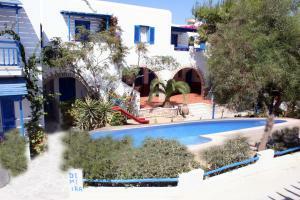 Hotel Dimitra is situated in a very quiet location, in Agios Prokopios area of Naxos Island, Greece. The distance from the magnificent sandy beach of Agios Prokopios is only 150 metres, away from the crowds, making the accommodation an ideal place for relaxing. The service is excellent, the atmosphere is authentically warm and the atmosphere is friendly. 24-hour Front Desk, Garden, Free Parking, Safety Deposit Box, Breakfast Buffet.